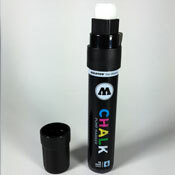 Molotow's washable chalk-based spray paint is great for events, projects, and promotions. Generally used for spraying sidewalks, windows, cars, and other non-porous surfaces, this product is a favorite of advertising agencies! This paint has the look of spray paint with the removability of traditional chalk. 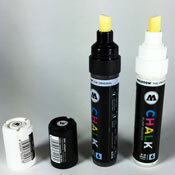 Molotow Chalk Pigment comes in 10-colors and is a non-permanent, medium-pressure removable spray paint. 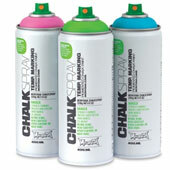 Spray Chalk has a matte finish and depending on weather may last for weeks outdoors if left untouched. 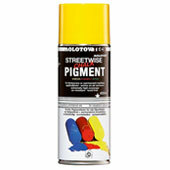 Molotow Spray Chalk is fast drying and can be easily washed or wiped away from most surfaces. Made in Germany. 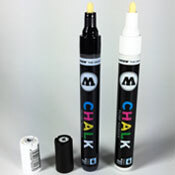 Check out Molotow Chalk Markers for more control and versatility! I have been using it for my art project which involves me spray painting a lot of trees, logs, leaves, dirt etc. in the outdoors. It works really well for coloring nature without causing harm to the environment. 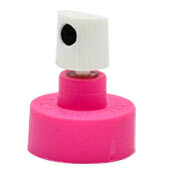 Also useful for marking areas on college campuses or for 5K races. 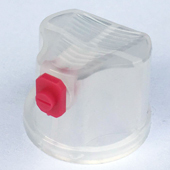 1 of 1 found this review helpful - did you? 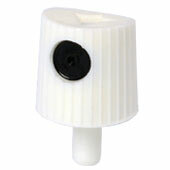 This product was added to our catalog on Monday March 10, 2008.